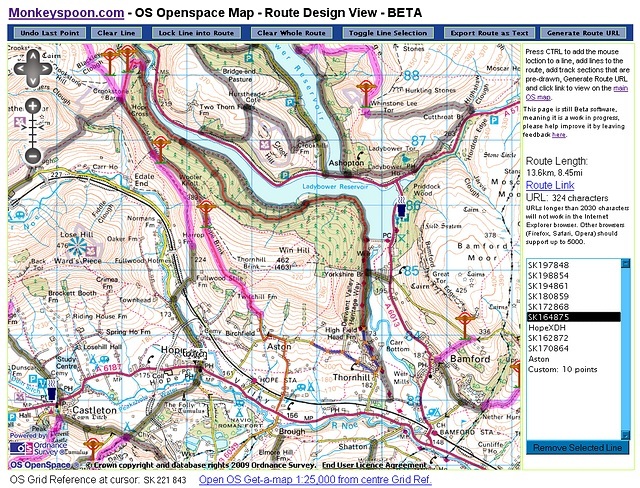 OS Map Route Designer Beta – Bike routes made easy! A year and a half ago we unveiled a little OS map showing tracks for the Tracks page, now we bring you a Beta version of our route designer for mountain biking in the Peak District – with a twist! Basically the idea behind it is that there are, relatively speaking, few places people would ride in the Peak District (compared to walking or driving), therefore instead of people constantly having to redraw routes and parts of routes, all the bridleways and joining road could pre-programmed into the map. This makes it possible to draw a very accurate route in a matter of minutes, that might take half an hour by the conventional method. To my knowledge no one else has done this for mountain biking routes. So far most of the Hope Valley and north has been entered, the west of Sheffield and White Peak needs a lot of work. It works in Firefox and should would in Internet Explorer 7 & 8. This is a Beta version, so it doesn’t look very pretty and is by no means finished, please try it out and leave feedback as a comment below. It is currently separate from the main OS map, but once further developed they can hopefully be merged. To add a pre-drawn track line (shown in semi-transparent grey) to a new route, simply click on it, a thin red line will appear down its length. The same goes for Tracks, shown in purple. Its ID or name will appear in the box in the sidebar, with the newest section at the top. To remove a section; click on its ID/name and then click the Remove Selection Line button. To draw your own section; move the cursor to your first point, then (briefly) press the CTRL key, an orange cross will appear (this can be dragged around), repeat this to draw a section, once done click the ‘Lock Line into Route’ button. Once you have your complete route, click ‘Generate Route URL’ then click the ‘Route Link’, this will display your route on the public version of the map (in another tab or window), to share this route select the URL from the new tab and copy & paste to where you want to share it. Looks like you have busy jeff! Will try it out later. We missed you at the last mule race last sunday. You missed a good un! Yeah, it’s taken a little while. Unfortunately I was busy and Irwin didn’t have the car last Sunday, when is the next one? Not sure when the next one is. It depends on when I can sort a Sunday off. Probably the third weekend in August. Will keep you updated.